The October 2016 edition of VARAC Pit Signals by Jeremy Sale has been released! Even as we speak, the Vintage Historic and Classic Directors are tabulating the VARAC Drivers’ Challenge points to determine who won each of our racing classes, as well as the overall club champion. There is already a rumour floating around that the overall championship ended in a tie! Don’t worry, our Race Director (and club President) will make the process clear before we make the final presentation. The club has two other trophies that we require the memberships’ assistance on – the Jim McGregor Spirit of Sportsmanship Award and the James Ferguson Challenge Trophy. To learn more about these awards, including a list of past recipients please visit:https://varac.ca/membership/awards/. Those persons with business to raise at the AGM, or Motions they would like presented to the membership should contact Gavin Ivory, the club Secretary (gavin.ivory@varac.ca) as soon as possible. We have specific notice periods that must be met before items may be considered and Gavin will be assembling the official package that will be sent out to the membership before the AGM. Are you a VARAC member that is not able to make it out to the AGM? Click here to print and send us your proxy! You know how they always say “the car is the star” in vintage racing, right? Well, this summer I had a chance to be a star off the race track for a change! 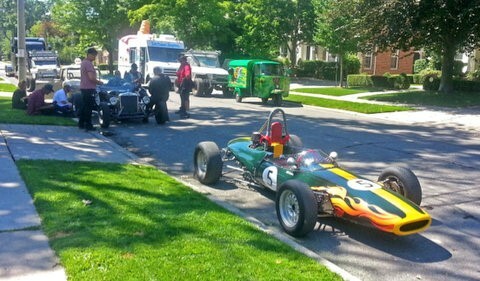 No sooner had we returned to Kingston from the double race weekends in Pittsburgh, than Ed Luce (my driver) was contacted by Ted Michalos, who had been in touch with a set decorator who needed to source a ‘vintage F1 race car’ for a commercial being filmed in a week’s time. As if one of those high-maintenance divas could have pulled this off. You know that type, all big noise and fast moves – real ‘Broadway musical’ – while this was going to require some restraint and subtlety for the small screen. Unfortunately for the set decorator, the weekend scheduled for filming was also the BARC race weekend at Mosport and most of the more local cars were thus unavailable or uninterested. As we weren’t going to be competing that weekend, Ted wondered if we might be interested in appearing in a TV commercial! 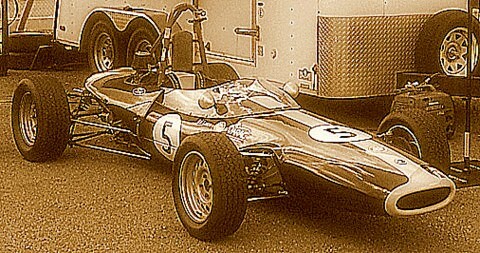 Of course, I’m no F1 race car but, as I said, a high-strung performer like that would not have suited this task at all. Fortunately, at a glance I look a lot like pretty much every other competition car that Lotus made in the mid 60’s, and I can idle along as low as 20 mph. I spent a couple of days in make-up, first having my usual suite of CASC-OR, VARAC, etc. decals removed and my badges covered. (When making a commercial they don’t like having any other company’s logo’s, trademarks, names, etc. in shot. I suppose it’s a combination of not having license to use those insignia and not wanting to give anyone else free advertising.) Then I had a ‘flame job’ applied to accentuate my nose – already one of my best features. Ed’s concerns about the noise levels of my un-muffled exhaust were rendered moot by the appearance on-set of an immense Peterbilt 389, a ’34 Chevy rat rod with straight pipes, and an honest to goodness M60-A3 ‘Patton’ main battle tank. 12 cylinders of barely muffled, air-cooled, twin turbo Detroit diesel make quite a racket on a city street. But a little three-wheeled Italian ‘Piaggio Ape’ delivery scooter probably made the most noise/bhp of anybody there. How can a single-cylinder air-cooled engine make so much noise? By revving flat-out to keep up with the blistering 29 mph (top speed!) pace dictated by the M60, that’s how. The film crew did camera shots from the front, camera shots from the rear, camera shots from on top of the tank, camera shots from down low on a golf cart driving up the sidewalk beside us, and camera shots from the perspective of the stunt kitten playing in the street. We must have stampeded up the street over a dozen times each day before the director was happy. In between takes, every little kid in the neighborhood wanted to sit in the driver’s seat and have their picture taken. Lots of happy locals may have helped to smooth things over and make up for the noise and dust. 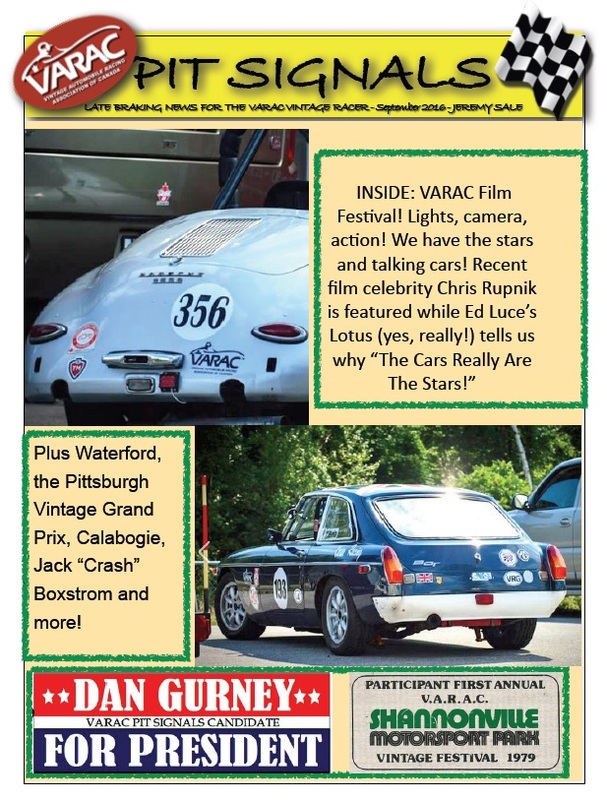 And Ed got to talk to quite a few people about VARAC, vintage racing, how wonderful Formula Fords are, etc. As part of the crew for this experience my driver Ed got to learn a bit, helping with what my regular crew Dorothy does routinely – helping the driver into the car, steering wheel on, belts on, connect battery (wait for the director to say “camera rolling” to start my engine), switch over to internal battery. Then grab the starting battery and run into the bushes or down a driveway to get the heck out of shot while we stampeded up the street on cue. After two days of shooting, it was back into my trailer (every film star has a trailer, don’t ya know). While this was all fun, I can’t wait until the next race weekend for a chance to blow the carbon out of my cylinders and to stretch my legs! The September 2016 edition of VARAC Pit Signals by Jeremy Sale has been released! 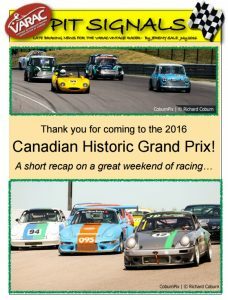 We can’t thank you enough for coming to the 2016 VARAC Canadian Historic Grand Prix! Friday opened with practice, qualifying and races for all grids and finished not with the previously traditional VARAC “Pot Luck Dinner” but with a new wrinkle, the Steam Whistle Brewing Paddock Tour. This independent Canadian beer company is justly proud of producing a Premium Pilsner and the tour involved three Whistle Stops. The concept is simply to move people around the paddock, to get them to mingle and meet, talk about their cars, and eat some dinner. Competitors, crew, and volunteers were all welcomed. The first Whistle Stop was hosted by club members Tom and Carol Burge, assisted by the MG and Triumph folks, serving chicken wings from Simply BBQ. Black Prince Winery offerings were also available. Whistle Stop Two was hosted by the good folks at Move Motorsports, assisted by the F1600 and Monoposto competitors, serving up Subway Sandwiches. Then it was on to Whistle Stop Three for dessert and coffee hosted by the VARAC board. There are wrinkles to be smoothed out to be sure, but it was a great move forward, well done to all concerned. On Saturday racing continued with more great weather and some really full grids, breaking at lunch for Can-Am demonstration laps. “Mini Meet North”, the largest assembly of Mini’s in Canada, provided an avenue for owners of this popular marque to gather together and show off their cars all weekend, and they also had an opportunity to lap the track on Saturday. Awarded on Sunday afternoon after the last session of the weekend, the Group 44 Inc. Award was presented to Jeff Govert (Spitfire #12) by last year’s recipient, Henry Frye. The fastest large bore Triumph went to Henry Frye with his TR-250. Fastest small bore Triumph was Russ Moore in Spitfire #49. Fastest small bore MG was Nick Pratt in his very fast Midget. The fastest large bore MG was Joe Lightfoot, MGB. The Victory Lane Magazine “Spirit of Vintage Racing” trophy was awarded to Dr. Lee Talbot. Many thanks to Doug Kurtin for again giving us really beautiful trophies to take home. Much appreciated, Doug! It was a superb weekend all round, blessed by great weather and tons of track time. Many, many congrats to VARAC’s CHGP Director Ted Michalos and his great team of volunteers! There were tons of people who pitched in, far too many to name, thank you all! We tried a number of new things this year and we’d appreciate hearing back from you how we did – the good and the not so good – it is only with your feedback that we can make improvements for next year. Send your comments to CHGP@varac.ca – thanks in advance for taking the time to let us know how things went. 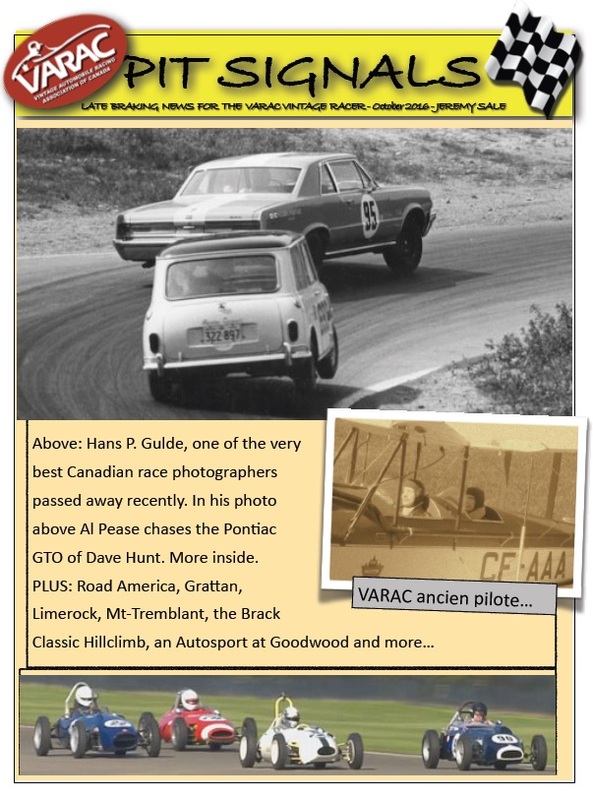 Bowmanville, ON – The VARAC Canadian Historic Grand Prix which will be held June 17 -19 at Canadian Tire Motorsport Park is proud to be supporting Prostate Cancer Canada’s Wear Plaid For Dad initiative at the track on Friday, June 17. “Many of our member’s have been directly or indirectly impacted by Prostate Cancer at some point in their lives”, says Ted Michalos, event director for VARAC’s CHGP, “it is with great pride that VARAC’s Board of Directors is pledging to Wear Plaid For Dad on our first day of our race weekend, we hope that all the competitors will join in with us and the paddock will be alive with plaid!”. Prostate Cancer Canada is expecting thousands of Canadians to put on something plaid to help raise awareness and funds to protect men from prostate cancer this Friday. Celebrity and high profile greats such as Don Cherry, vice Admiral Norman, Dave Thomas, Premier McNeil, Eric McCormack, Chief Saunders and John Catucci have backed this initiative and social media is alive with the support. It’s a fun and easy way to help protect men from prostate cancer. Join us and pledge to wear plaid www.wearplaidfordad.ca on Friday June 17th! Come one, come all – if you haven’t been a spectator at a racing event for a while then we may have the perfect weekend for you! The Toyo Tires F1600 Championship is also running a 25 car grid. This is some of the best racing you can watch anywhere! New this year is the Formula Vee Spectacular which has drivers from two F1200 Series competing. The Challenge Cup Series is a cross-border Formula Vee groups is being joined by CASC-ORs Millers Oils F1200 Championship. We expect 6, 7, 8 car trains drafting up the back straight. If you like to watch close racing – these guys are it! Off track on Sunday (Fathers’ Day!) there is the Field of Dreams Car Show by corner 8, as well as the Legends of Motorsport discussion panel that is open to the public at noon in the Canadian Tire Motorsport Park Conference Centre. Bring your lunch and meet some of Canada’s greatest motorsport personalities. The final on track session for the weekend is the VARAC Grand Prix open to any and all Vintage and Historic cars, as well as Classic cars weighing less than 2500 pounds. We expect this to be a grand finale indeed!